Pets Costs > How Much Does a Lionfish Cost? How Much Does a Lionfish Cost? A lionfish, also known as a Pterois, is known to be a venomous marine fish that is commonly found in the Pacific ocean. The lionfish is known for its spiky rays and the mixture of red, white, and black stripes of color. This fish is classified by nine different species and is very commonly found in saltwater tanks. The cost of a lionfish will depend on the size of the fish, the variety, the breeder selling it, quality and its age. On average, plan on spending anywhere from $15 to as much as $110 for the fish. For instance, a common species, such as the Black Volitan Lionfish, can retail for $31 to as much as $88. From our research, it appears the smaller the size of the fish, the cheaper it will be. A fish that measures one inch to three inches, for instance, can fall within the $30 to $45 range, while a fish larger than seven inches can retail for $80 to $110. Another common species such as the Devil Lionfish can retail for $27 to $65. Again, the length of the fish can greatly affect the price. A fish that is smaller than two inches can retail for $25 to $35, while a larger fish over six inches can retail for $50 to $65. Also purchased for consumption, lionfish meat can be found at local fish markets and even grocery stores, such as Whole Foods, for about $8 to $11 per pound. According to this USA Today article, the average fisherman is paid close to $4.50 per pound for their catch. Depending on the breeder that is selling it, some often include starter food, a guide on how to care for the fish and a temporary aquarium. Growing six to 18 inches in captivity, the lionfish has vivid red, white and black colors and will add great appeal to any fish tank. Their behavior, according to Petco, is known to be solitary and are not known to be a very active swimmer. When their meal is in sight, they attack swiftly. Due to the nature of a lionfish, a saltwater tank that is larger than 55 gallons is highly recommended and temperatures should be kept around 72 to 78 degrees Farenheight. Inside this tank, it’s best to also budget for the filters, rocks, decorations, water testing kits and hiding spaces. The diet of a lionfish will include frozen krill, squid and silversides, and they must be fed twice per day. It’s best to budget around $20 to $35 per month per lionfish. If the fish has to be shipped, shipping fees will more than likely apply due to the complexity of shipping a fish. 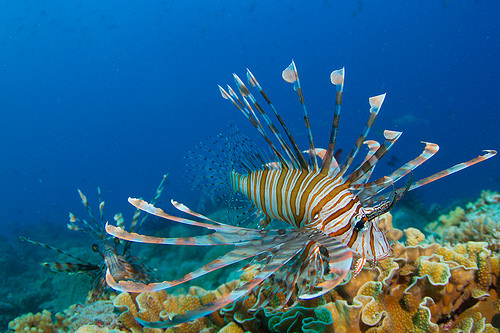 Lionfish are known to be a hazard to humans. Because of this, their venom has to be taken very seriously and should be handled with care. These fish tend to have a very hostile attitude, so it is best to know how to properly care for one if you are thinking about purchasing one. It is best to research the fish they can coexist with inside a tank. Since these fish often feed on smaller fish, you would not want to jeopardize your other fish. Due to the nature of the fish, a lot of swimming room will be required. As noted above, it is best to have a tank that is larger than 55 gallons. A healthy lionfish will have clear eyes, a healthy appetite and will have bright coloring. Red flags to look out for include a loss of color, fungus on teh body, erratic swimming and cloudy-like eyes. This variety is susceptible to fin rot, which is a frayed-looking fin where it reddens at the base. If purchasing from a breeder or pet store, make sure that you research the breeder selling it. It is best to purchase from a reputable breeder so that you know you are getting a quality pet. Consider looking for an owner who is looking to get rid of their fish. Oftentimes, you can purchase the fish, along with all of the necessary equipment for a fraction of the cost when compared to buying new.